New Zealand is renowned for its vast array of action-packed activities from skydiving and glacier hiking to white water rafting and bungee jumps. Now there’s a new kid on the block, the Nevis Catapult. The latest invention from the team behind the AJ Hackett bungee catapults thrill-seekers 150 metres across a valley at about 60 miles per hour. The Nevis Catapult is located in Queenstown on the South Island and will be available for the trade to sell next year. Book it: Discover the World has the 28-day Spectacular North and South tour that covers all corners of New Zealand including Queenstown from £2,858pp, excluding flights. Book it: Premier Holidays has a 10-night South Africa trip from £1,598pp, including four nights in Cape Town with a Table Mountain abseil experience. Price includes flights and seven days’ car hire. “Colorado Springs is home to some incredible scenery – staying inside isn’t really an option here,” says Malcolm Davies, Funway Holidays’ product destination manager. “For daredevil experiences, this area has some of the best zip-lining around.” The Colo-Rad zip line tour sees guests soar over the foothills of Manitou Springs at the foot of Pikes Peak. The course features five zip lines ranging between 68 and 182 metres in length and lasts approximately two hours. Book it: Funway Holidays has seven nights in Colorado Springs including the zip line tour and flights from £1,225pp based on two sharing on a January 16, 2019, departure. Oman’s Al Hajar mountains are fast gathering pace as a hotspot for adventure lovers with high-altitude cycling routes, off-road drives and scenic hiking trails on offer. 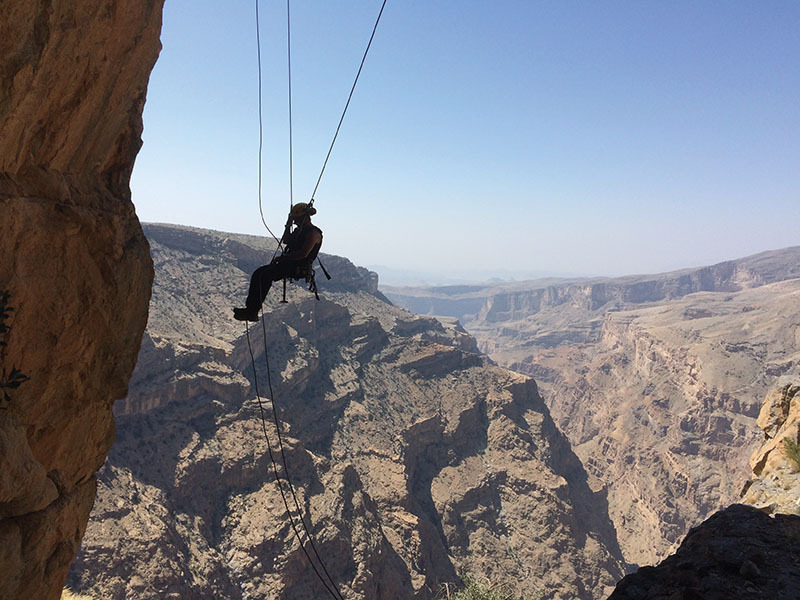 Yet for those wanting an extra helping of adrenaline, Alila Jabal Akhdar has the highest via ferrata in the region – a protected climbing route built to international standards. Adventurous types are harnessed in before stepping out on to 20-metre-high ropes and traversing the mouth of a cave right below the resort itself. Book it: A seven-night half-board stay at Alila Jabal Akhdar starts from £2,695pp including flights, private transfers and UK lounge passes. Based on a June 2, 2019, departure. The Himalayan region of Ladakh is an adventurer’s mecca with its jagged peaks providing activities aplenty. One such thrill is white water rafting on the Zanskar river. Clients on Intrepid Travel’s India Himalaya Hike, Bike & Raft in Ladakh embark on a rafting adventure, taking in an 18-mile stretch of river from Chilling to Sangam featuring grade three to four rapids and beautiful scenery. Book it: Prices from £1,165pp, including transportation, accommodation and some meals but excluding flights. Departures from June to September 2019.